TDI-Brooks International, Inc (under contract to TGS), recently completed an exploration geochemistry program in the Southern Gulf of Mexico consisting of 1,180 USBL positioned piston cores for geochemistry, with an additional 120 heat flow measurements for basin modelling and 120 20m “jumbo” piston cores for stratigraphic analysis and age dating. 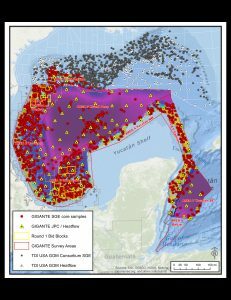 The TGS Gigante Mexico GoM Multibeam and Coring Program was the world’s largest offshore seep-hunting survey, covering the vast offshore sector of Mexico, including world class producing trends such as the Perdido fold belt and Campeche Bay. TDI-Brooks is in the first stage with TGS to collect cores with advanced geochemistry analysis for the TGS Otos multibeam and seep study project in the U.S Gulf of Mexico. The survey is designed to mirror the Gigante multibeam and seep study in the Mexican Gulf of Mexico, conducted in 2016. The new program will cover approximately 289,000 km2 and include 250 navigated piston cores with 750 baseline petroleum advanced geochemistry analysis, 25 Jumbo Piston Core (JPC) and 25 heat flow (HF) stations.